At the crazy quilting yahoo group, a challenge was issued to everyone to make a quilt (large) by 2-0-1-2! 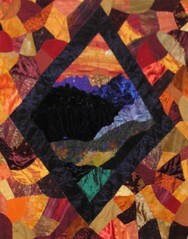 The idea being that we all get a big project complete AND selected quilts will be shown in an exhibit at an AQS show!! WOOOHOOO!!! Sewwww.... with that nudge, I brought out the "Forest Within" and have pieced the outside and am now appliquing it prior to embroidery. I'm pleased with where its going! Last view you all had, it was just the diamond center. I plan to take the dark border around the outside as well and drop in some orange/burgund colored fans at the points of the diamond to accent it. Its exciting to see this starting to take shape! 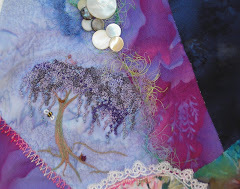 Then I will start on another that I want to do that will be done with large hexagons. More on that later! Oh! Leslie it's LOVELY! Of course you know me - I LOVE the colors, but WOW! Wow that is coming along so nicely!! Stunning. How big is it? it looks quite large? I love the colors. I cant wait to see how this turns out!Just lovely! Leslie!!! I didn't know about this! It is absolutely awesome! I know we started on piecing techniques but you definitely have to teach me more...please? This and your pink making memories block have so much character in their piecing alone! Ooooooo, is that ever looking pretty!! Leslie, this is going to look spectacular. I love the 'structured' layout - it's very eye catching! Wow Lelsie beautiful!!!! I just love the colors they are all right up my ally....very pretty. You go girl!!!!!! Wow so lovely...so YOU Leslie! I cant imagine how many hours this took to do those tiny CQ bits...wont ask lol! So very beautiful and the colours are earthy and soothing too. YOU ''ALWAYS'' AMAZE ME..your work is so wonderful.